Skiers and snowboarders, ages 5 to 10 years old, worked on their jumping skills with instructors at the Jr. Air Affair Skills Clinic and Competition Saturday at Mt. Holiday in Traverse City. After taking part in a morning clinic, skiers and snowboarders tried out their new aerial skills on two ramps. Keelin Lundwall, 10, of Traverse City, launches his snowboard off a ramp at the Jr. Air Affair skills clinic and competition Saturday at Mt. Holiday in Traverse City. 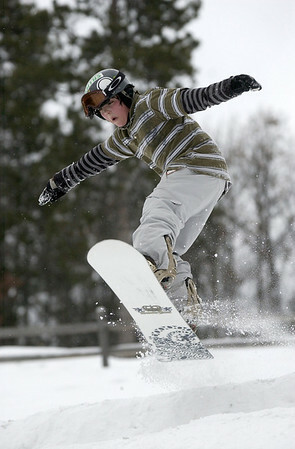 Skiers and snowboarders, ages 5 to 10 years old, worked on their jumping skills with instructors. After taking part in a morning clinic, skiers and snowboarders tried out their new aerial skills on two ramps.